The role of the Greater Sydney Commission is to lead metropolitan planning for the Greater Sydney Region, and to promote orderly development by aligning infrastructure decision-making with land use planning. 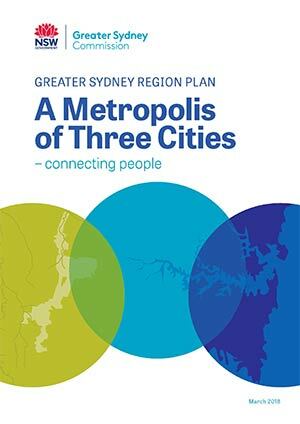 This Plan sets out the long-term vision for the Greater Sydney Region. Delivery of the Objectives and Strategies of the vision requires the Greater Sydney Commission, the NSW Department of Planning and Environment and councils to work collaboratively to complete the region’s hierarchy of strategic plans and enable consistent, transparent and fair decision-making. governance frameworks that support project collaboration for metropolitan-scale initiatives such as the Western Sydney City Deal and Collaboration Areas and that emphasise stakeholder consultation, monitoring and reporting. Figure 58 shows how each of the participants in the process can bring their strengths and legislated responsibilities to create a holistic and successful planning system for Greater Sydney. District plans are presented through the themes of liveability, productivity and sustainability, and also address infrastructure and collaboration. They focus on identifying the Planning Priorities and Actions for each district, in the context of the specific economic, and social environmental matters of the districts. Regional and district plans inform the preparation and endorsement of local strategic planning statements and assessment of planning proposals. Councils are to implement the region and district plans over a two-year or three-year timeframe (see text box) following the finalisation of the district plans. This involves councils reviewing their existing local environmental plans, undertaking necessary studies and strategies and preparing a local strategic planning statement which will guide the update of the local environmental plan. To accelerate the local planning process, the Housing Affordability Package announced by the NSW Government in June 2017 requires the Greater Sydney Commission, as part of a suite of policy measures, to nominate 10 Priority Councils in Greater Sydney, which will each receive up to $2.5 million to assist with updating their local environmental plans to give effect to the district plans, within two years of the Commission releasing final district plans. The role of the local strategic planning statement is to provide an effective alignment between regional plans and local plans. The legislative requirement for local plans to ‘give effect to’ regional and district plans can be assisted by protocols that formalise cooperation between State and local government in that many of the opportunities and challenges in giving effect to the region plan are inter-related with government programs, particularly infrastructure investment. Figure 59 identifies both the structure and relationship of regional and district plans and the cascading nature of the vision, Objectives, Strategies and Actions. provide a structure for the ongoing review of the region and district plans that is informed by local inputs. Local planning is also informed by councils’ community strategic plans. These community focused plans provide the strategic framework for the planning and delivery of services over a 10-year period for each local government area. They set the economic, social and environmental context for each local government area and are part of the broader Integrated and Reporting Framework under the Local Government Act 1993. Community engagement underpins each community strategic plan and provides detailed local considerations to be addressed in councils’ local environmental plans, delivery programs and operational plans. State environmental planning policies also form part of the planning framework for Greater Sydney. As noted throughout this Plan, these policies cover specific social, economic and environmental matters that may impact on a local government area. The NSW Department of Planning and Environment is currently reviewing State environmental planning policies as part of initiatives to simplify the NSW planning system and reduce complexity. This review process will modernise, simplify and improve the effectiveness and usability of the policies. Planning proposals are also guided by section 9.1 of the Environmental Planning and Assessment Act 1979, a suite of Ministerial Directions which require consideration for local plan making that cover issues such as employment, environment and heritage, housing, infrastructure and urban development. Several State agencies have a role in the delivery of housing supply. The Land and Housing Corporation delivers social housing and renewal through a range of programs including Communities Plus. The NSW Government is committed to improving housing affordability by increasing housing supply, including by accelerating rezoning and building infrastructure such as roads, schools and utilities that can enable development. It is important to provide the right conditions for developers to supply enough new housing in the right places. Where State agencies have a role in delivery of growth through State planning policies and programs the Greater Sydney Commission, as an independent organisation under the Greater Sydney Commission Act 2015, can be called on to provide a peer review role. A peer review role would consider consistency with the region and district plans and responses to community consultation as well as matters such as design quality. Develop the Greater Sydney Commission’s role in peer reviewing key land use and infrastructure plans prepared by NSW Department of Planning and Environment to provide assurance to the community that robust planning is being undertaken across Greater Sydney consistent with the region and district plans. This approach allows for a differentiation between the role of the NSW Department of Planning and Environment in undertaking more detailed planning work in Planned Precincts and Growth Areas and the role of the Greater Sydney Commission in preparing region and district plans, together with other key plans nominated by the Minister for Planning or the Greater Sydney Commission. This will capitalise on the independence and expertise of the Greater Sydney Commission.